Got on TastyTrade again 2-21-2014, we talk about Delta, Karen the Supertrader and naked PCLN straddles. Got on TMZ live again 2-20-2013. This was a flash appearance on TMZ. Christi from TMZ Skyped me asking for a quick opinion about Emma Smith. I wasn't even watching the show, but someone had dropped out and she they saw me online. I quickly read the story and gave a 10 second comment. I was also on TMZ Sports on 2-18-2013, but it looks like they cut my comment. Probably for the best, but the clip was great and worth a look to see Kate Upton! Last year was my best trading year ever. I decided to refocus my efforts in trading and have evolved into mainly trading volatility instruments. I will also play some momentum stocks as they come up, but I'm primarily watching the VIX and sell puts when the VIX gets high, which is now between 18-20 point range. I will also start shorting the VIX, via selling calls on UVXY, when volatility finally collapses. 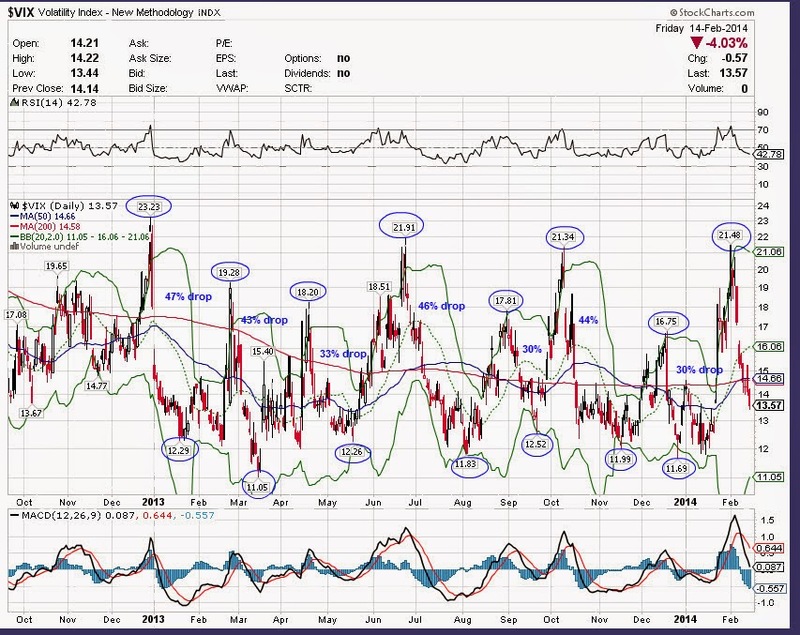 Below is a chart of the VIX for the last year. You can see in 2013 the VIX had 6 spikes above 18, including the 1st day of the year where the VIX was over 23. After each spike, it quickly fell an average of 40%! Since you cant directly bet on the VIX you need to use ETFs like VXX, UVXY, XIV and SVXY to make your bets. UVXY is a 2X leveraged fund and will move 2X the VIX futures, so it will decline twice as fast or increase twice as fast. 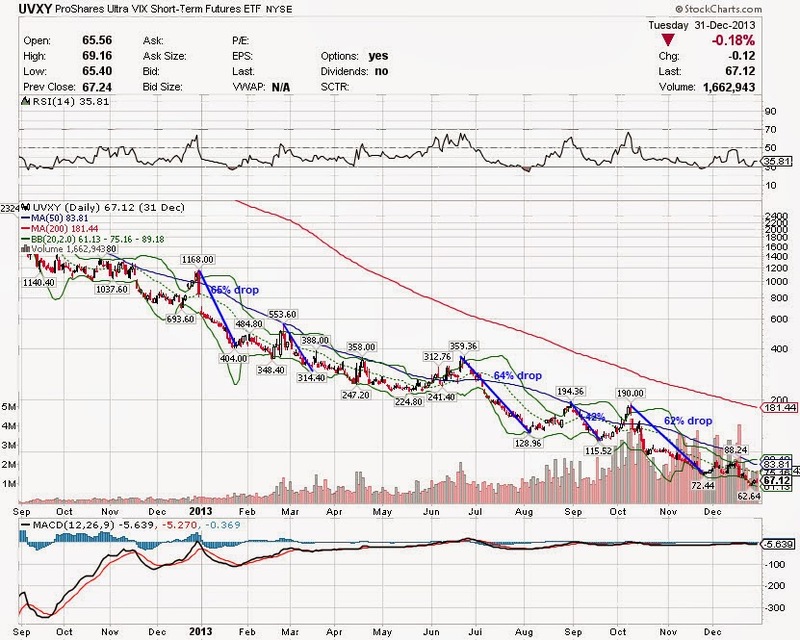 UVXY will decline an average of over 50% when the VIX collapses. Chart of UVXY for 2013, the numbers are huge because UVXY has a few reverse splits during the year. This is an ETN that can actually go to zero, but it routinely has 10:1 or 4:1 reverse splits to get its nominal value back up. Just sell this short or sell naked calls, it eventually will go to zero, but can have huge spikes up before it does, but it never lasts for very long. The spikes up are usually not more than 4 weeks. The nice thing about trading these instruments is that if you can follow the market direction, you can really out perform the indexes, since they move so much faster than the index you can make up loss ground quickly. So when the market starts to turn down, go long UVXY. It usually rises 4X what the decline in the S&P is. When the market starts to climb back up or stabilizes, then buy the SVXY and short UVXY. Your gains should be 4X the SandP rate of return. Usually the problem with these ETFs is staying in them long enough to gain the benefit. Since they move so quickly, they can scare you out of your position so you need a strong stomach to with stand the volatility. Trading volatility is volatile, but volatility always reverts back to a mean! My company Apriso a division of Dassult Systemes had its first ever Winter University for most of its Services Organization employees. We all had rooms at Bally's Hotel in Las Vegas. I actually was fortunate to get a suite with a Jacuzzi, Bidet, a King and Queen bed. Only 3 of 37 guys were lucky enough to get a suite and I was just randomly lucky to get selected. The days were filled with learning new things within our company and new software enhancements. The main attraction was 'team building' at Exotics Racing, where we all got to drive various exotic cars! I got to drive an Aston Martin Vantage S, a $185,000 car! Below is a video of me driving 4 laps around the track. You actually are driving with other people on the track and you can actually see me passing a green Lamborghini at the end of the video. Here is a link with everyone's best lap times. 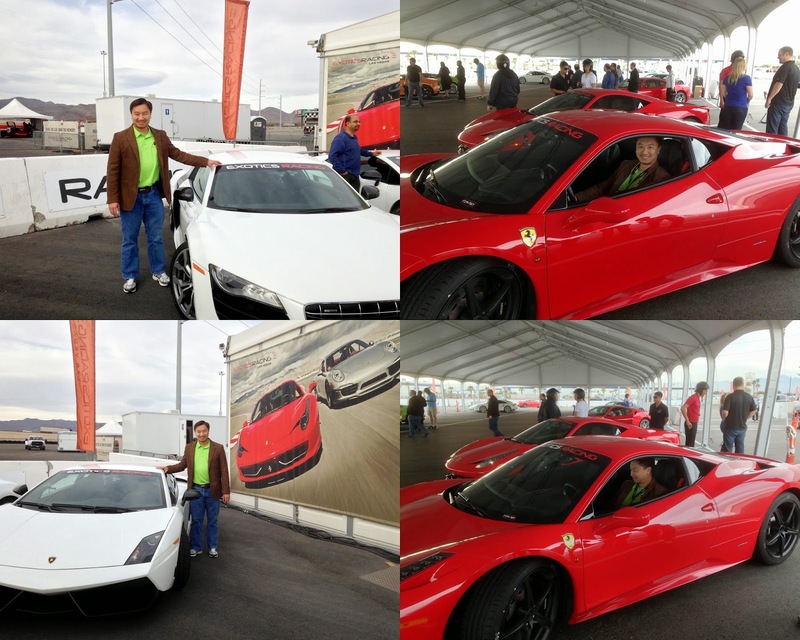 Here are some pics next to a Lamborghini and Ferrari. Here are some Vine videos links: Ferrari F9, Race Track Racing, The Streets of Vegas, The Bidet, What the Heck? Grand Canyon. Got on Tasty Trade again! I did a follow-up call with Tom and Tony. Talked about my $UVXY position and going long the $VIX with his daughter Case.